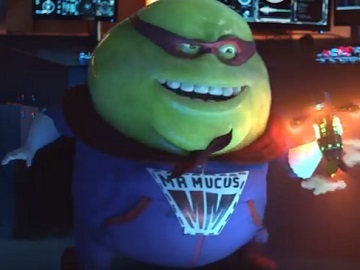 Mucinex advertises the Mucinex Cold & Flu All in One in a new commercial, that shows us what happens when Mr. Mucus tries to be a superhero’s sidekick. The 30-second spot, created to look like a movie trailer, is set in a space ship and opens with the voiceover announcing, in a dramatic voice, that “This winter, a hero will fight… his cold.” At this point, Mr. Mucus shows up wearing a red superhero cape. “What do you think? Sidekick material?” he asks the hero. The latter, who is not in the mood to deal with Mr. Mucus, pushes a button that leads to a package of Mucinex Cold & Flu All in One being brought to him. “Mucinex Cold & Flu All in One fights sore throat, fever, cough, sinus pressure, chest congestion, headache, nasal congestion, body pain, all in one” the voiceover adds. These lines are flashing across the screen as they are said and, at the end, the words “All in One” appear with caps lock, which makes Mr Mucinex ask “Did you really need the caps lock?”. When the hero gives Mr Mucinex the package of Mucinex Cold & Flu All in One to hold it, he gets enthusiastic, delighted that he finally gets some action, but what follows is his exit through a gate in the ceiling. The commercial ends with the voiceover urging viewers to “Get tough on cold and flu symptoms with Mucinex Cold & Flu All in One”.